Counseling begins and ends with the needs of human beings. Gain experience working with diverse populations in diverse contexts by earning a Human Development Counseling degree in Clinical Mental Health Counseling or School Counseling from Vanderbilt University. The HDC master’s degree trains you to translate sound theoretical knowledge and research into effective counseling programs as a clinical mental health or school counselor. In a rigorous and integrated program of study, you will acquire a strong theoretical grounding in human development, counseling paradigms, and change strategies. Class sizes are intentionally small in the Human Development Counseling program and are designed to foster close working relationships between you, our faculty, and community partners. Such a personalized approach results in more productive classroom time and a more valuable field experience. Clinical Mental Health Counseling: This track prepares you for a career in various social service agencies, mental health centers, and employee assistance programs, as well as other mental health organizations. Private practice as a Licensed Professional Counselor (LPC) is an achievable goal if you pursue this track. School Counseling: This track prepares you to work as a professional school counselor in grades K–12. Program requirements lead directly to licensure as a school counselor by meeting all of the requirements established by the Tennessee State Department of Education. This track is also available online. The master’s degree in Human Development Counseling is accredited by the Council for Accreditation of Counseling and Related Educational Programs (CACREP). The School Counseling track is also accredited as part of institutional accreditation awarded by the Council for the Accreditation of Educator Preparation (CAEP). The new online School Counseling degree is currently seeking CACREP accreditation. In 2018, 21 students earned master’s degrees in the Clinical Mental Health Counseling (CMHC) Program and 14 students earned master’s degrees in the School Counseling (SC) Program. Of the 24 students admitted to the CMHC Program, 21 students (87.5%) completed the degree in Human Development Counseling in 2018. Three students (12.5%) completed the degree in Human Development Studies. Of the 14 students admitted to the School Counseling Program, 14 students (100%) completed the degree in Human Development Counseling. Because the HDC program is accredited by CACREP, students are eligible to take the National Counselor Exam the semester before graduation. The NCE is not a program requirement but the majority of students in both tracks sit for this exam before graduation. Of the 16 CMHC students and 13 SC students who took the NCE exam in 2018, 100% passed the exam. School Counseling students are required to take the Praxis exam as part of the requirements for licensure as a School Counselor. Pass rate for this exam was 100%. Of students pursuing full time employment after graduation, 100% (15/15) of SC 2017 graduates obtained full time employment in counseling within 6 months of graduation and 100% (16/16) of CMHC 2017 graduates obtained full time employment in Clinical Mental Health Counseling within 6 months of graduation. There are 61 students enrolled in the Clinical Mental Health Counseling program and 22 students enrolled in the School Counseling program. Class sizes range from 5 to 7 students in Practicum and Internship seminars. Core classes including both program tracks may average 30-33 students per class with the average size of program area classes consistent with track size, approximately 14-23 students per class. Program Director: Gina Frieden, Ph.D.
* We will continue to accept applications after this date, but applications will be evaluated for admission and scholarships on a space-and-funds-available basis. Clinical Mental Health Counseling students often seek licensure and enter positions as Licensed Professional Counselors in for-profit or nonprofit agencies, private practice settings, or at private or charter schools as a mental health counselor on staff. Some go on to doctoral study in counseling or related fields. School Counseling students often obtain licensure and work as school counselors in public or private K-12 settings. See our 2018 Outcomes Report. 98% of Human Development Counseling graduates were employed or attending graduate school within four months of graduation. Child and Adolescent Therapist, Thrive Counseling, Fayetteville, N.C.
Clinical Mental Health Counselor, Oasis Center, Nashville, Tenn. Counselor, Rogers Behavioral Health, Chicago, Ill. Mental Health Clinician, Vanderbilt University Medical Center, Nashville, Tenn.
Ph.D. Candidate, Clinical Psychology, University of Colorado, Colorado Springs, Colo.
Golden Gate Middle School, Naples, Fla.
Nashville School for the Arts, Nashville, Tenn.
Oklahoma City High School, Oklahoma City, Okla. Both tracks in the Human Development Counseling program include a practicum and full-year internship placement in a mental health, social service agency, or school setting under supervision. You’ll develop fundamental counseling skills such as relationship building, basic assessment, goal setting, selecting interventions, and evaluation of client outcomes. Field experiences are designed to be supervised placements that are practice-oriented and provide a safe place to explore new skills. Through an experiential and humanistic training model, you’ll develop a strong theoretical grounding in human development and evidence-based practices within either program track: Clinical Mental Health Counseling or School Counseling. This theoretical base is then shaped and honed through a 1-year internship experience that provides opportunities to apply your knowledge and skills. The Clinical Mental Health Counseling track requires a 60-credit-hour program of studies. Included in this curriculum is a full-year internship placement in a mental health or social service agency setting under supervision. Elective Courses: 9 credit hours are required. Program electives are listed below. The School Counseling track includes a 48-credit-hour curriculum with a full-year internship placement in a school setting. This curriculum includes 42 credit hours of required courses and an additional six semester hours of elective courses. Electives: 6 hours are required. Program electives are listed below. 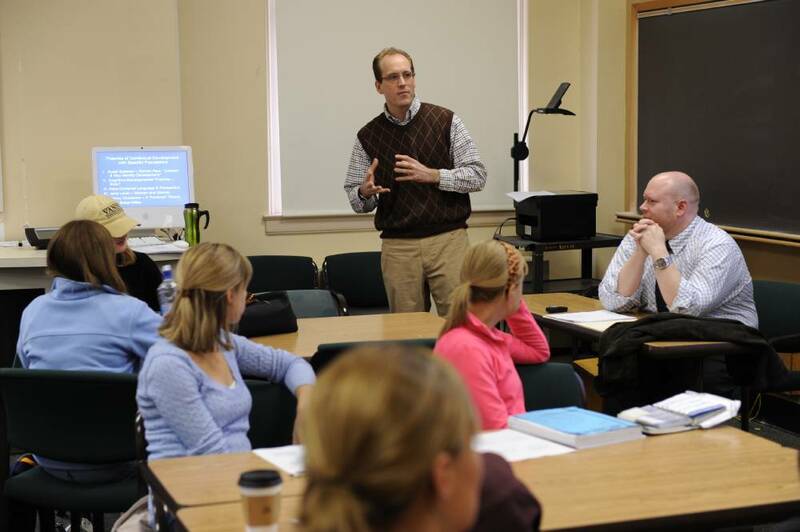 All core and affiliated faculty are engaged in a variety of interdisciplinary teaching and professional activities. In addition to an on-campus master's program in Human Development Counseling, Peabody also offers an online master's program in the school counseling specialization track. For information about our online program, please visit the Online Master of Education with School Counseling Specialization.